It was early morning on the University of Wyoming campus when the photo shoot of UW student and master illusionist John Rotellini finished. As Rotellini and the UW photographer entered the elevator, the smell of lighter fluid lingered in the air. The elevator doors shut as they slowly rose to the second floor. Suddenly, the elevator came to an abrupt halt as a high-pitched alarm sounded. The lights in the elevator dimmed and they both realized the elevator was stuck between floors. The fire alarm was set off by the smoke created during the just-completed photo shoot. The pair, trapped in the elevator, had no choice but to wait for assistance. The photographer was intrigued by Rotellini and his capabilities; he wanted to know more about him. Rotellini, a communications senior from Sheridan, will graduate Saturday, May 7. They sat down. "So what do you want to know?" Rotellini asked. "Well, let's start with the basics," responded the photographer. 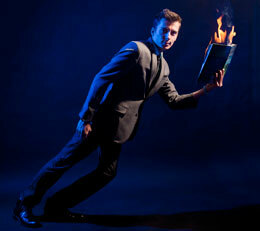 Born and raised in Sheridan, Rotellini, 22, started his practice in magic as a young boy. His first trick consisted of a coin illusion; turning two coins, what seemed to the public eye, into two different coins. From there, his interests grew. Rotellini enjoyed high school, participating in activities such as sports, student government and community involvement. "Magic is one of two things. It's either the coolest thing you've ever seen or the cheesiest thing with bad spandex, terrible 70s music and terrible dancers," he says. Curiosity struck Rotellini in the summer of 2006 when attending the American Legion Boys State, a program designed for scholarly high school students entering their senior year and interested in the operation of government. While there, Rotellini met two peers who performed small card tricks. He wanted to learn more about magic. After returning home, Rotellini visited his local library. There, he found a vast array of books dedicated to the tricks and illusions of 18th century magicians. Soon, Rotellini was watching the famous illusionists of today, Criss Angel and David Copperfield, and recognizing the tricks from the books he had been reading. Rotellini knew magic and illusions were his future and to fulfill those dreams he would have to contact leading illusionists and magicians in the world's magic capital -- Las Vegas. He shared his story with top Las Vegas magicians in hopes of learning something about the profession, and they suggested books to read and offered advice on how to get involved in the business. "I wanted to do it right. I didn't want to do it half-heartedly," he says. After graduating high school in 2007, Rotellini headed to the magic capital. There, he was invited by Copperfield to attend one of his shows as his guest. By dumb luck, as Rotellini would refer to it, he was picked to assist Copperfield on stage in a disappearing illusion that night, helping to vanish 12 people. "After the show, one of the first things he told me was, ‘So, I hear you do magic.' I thought wow, David Copperfield hears I do magic! I've been told by his staff that he keeps tabs on me to see what I'm doing," Rotellini says. "Apparently he knows my name, which is saying something because I'm a kid from Wyoming." It was then that the name "John Rotellini" was introduced into the world of illusion and magic as an up-and-coming act and brand. Since then, Rotellini has received advice and help from established entertainers Angel, Penn and Teller, Franz Harary, mentor Doug Malloy, Lance Burton and Jay Owenhouse -- just to name a few. "There is a trade off when you learn how tricks are performed. The magic isn't where it is for everyone else," Rotellini explains. "The biggest reward is seeing someone else like your magic." Supported by his parents, Rotellini has worked to fulfill his dreams while still working to get an education. Rotellini plans to take the knowledge he learned at UW and apply it to his magic act and also to the development of his own entertainment firm. "Because of my craft, it was better to learn how to market myself," he says. Along with the education gained, Rotellini also has developed a skill for multitasking. Since arriving at UW, he has performed his act in two college tours while maintaining full-time student status. "It's great to be at a place where I can chase a really odd dream," he says. "At times, it's been a hard journey with little sleep and a reduced social life, but it's paid off." After graduation, Rotellini will work as chief marketing officer and associate producer on an internationally-syndicated television show called, "The Holiday Promenade of Stars," hosted by Mario Lopez. The show may include celebrities such as Justin Timberlake, Kid Rock, Dolly Parton, Maroon 5 and Aerosmith. Rotellini also will be mentored by magician Kirby VanBurch to learn how to perform big cat acts and practice larger illusions, while ultimately attempting to achieve Guinness World records. "Performing illusions is a lot of work back stage, but once you're on stage -- it's great," he says.